If you have decided that outsourcing reverse engineering services makes the most sense for your project or business, you still have some decisions to make. Not all reverse engineering applications are the same. You must decide what type of equipment to use and what kind of output you need, as well as consider a range of other factors. This checklist is designed to help you get started. What is the objective of reverse engineering? Your provider will need to know your end goals in order to help you make the most cost-effective decisions. What type of reverse engineering makes the most sense for your application? You can decide between design intent, verbatim (as-built), or a hybrid of the two. 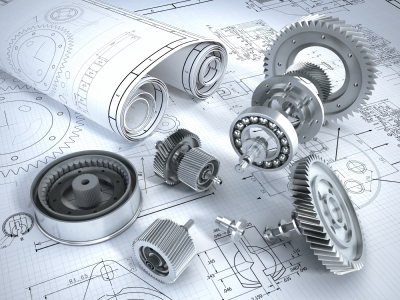 When reverse engineering for design intent, the measurements of the original object may be adjusted to correct for imperfections so that the final product will function in the desired way. 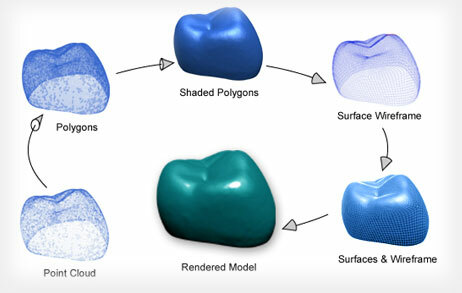 The verbatim approach aims to create an exact replica of the original object, including imperfections, and the hybrid approach can be used in cases when the original object features multiple types of surfaces. How should you process measurement data? When gathering measurements to reverse engineer an object, you can use a dimension-driven approach, shrink-wrap surfaces, or a combination of the two. How accurate do you need to be? Depending on your objectives and the reasons for reverse engineering, your application might need a certain degree of measurement accuracy. For example, in the case of an object that must meet regulatory specifications, accuracy is extremely important. However, if you are replicating a statue for sale in a gift shop, some minor differences are acceptable. Does the original object need to remain intact? In some cases, in order to get the most accurate measurements, the original object will need to be disassembled or even destroyed. If this is not an option for your application, your provider must know that at the beginning of the process. What type of equipment should you use? Many different types of measurement equipment can be used for reverse engineering. Your provider will consider the level of accuracy required, surface characteristics of the original object, and many other factors when deciding how best to take measurements. Do you need to measure the object in a constrained state? For some applications, measuring the object while in a state that simulates how it's shape will conform in assembly makes more sense. You might also need to measure other objects or parts if you are reverse engineering an item that is part of an assembly. Your provider can (and should) help you answer many of these questions, so don't be afraid to ask. One of the greatest advantages of outsourcing reverse engineering services to providers such as Q-PLUS Labs is that we operate across multiple industries. This means that we offer a broad range of equipment types and the expertise to handle almost any reverse engineering application. Contact us today to learn more or to get started on your next reverse engineering project. Purchasing dimensional inspection equipment requires making a big decision, and in most cases a significant financial investment. It is important to be certain that the equipment you buy will serve its intended purpose and provide the results you need. Because there are so many different types of equipment that can be used for a broad range of purposes, it helps to know what questions to ask before you buy. What sensor type do you need? Depending on the surface characteristics of the objects you intend to measure, you may need either a contact sensor or a non-contact sensor. Within each of these two categories are several other options and different sensor types. The more you know about the objects you will be measuring, the better able you will be to select the right types of dimensional inspection equipment. What tolerance levels are required for your application? There is a big difference between replicating an antique to sell in a gift shop and mass producing components that will be used in a medical device. In the former case, a certain amount of inaccuracy is tolerable, while in the latter case the requirements are more stringent. Make sure you know how precise you need to be, especially if you have to maintain regulatory compliance. Does your equipment need to be portable? Do you need a machine that will always sit at the end of a production line, or do you need a more portable unit that can take measurements in the field? What size(s) are the objects you need to measure? Some objects are small enough to be put into a machine, while others are simply too large or heavy. On the other hand, objects that are on the nano scale will require specialized equipment. What shape(s) are the objects you need to measure? Does your object have internal geometry that you need to measure? Bore holes, threads, and other complex geometry cannot always be measured by certain types of dimensional inspection equipment or without certain accessories. How fast do you need results? Measuring the occasional prototype is a different scenario than inspecting every component that comes off a production line. It is important to know how quickly you will need results so you can purchase a machine that is capable of meeting your needs. Does your equipment need to be automated? 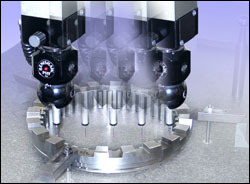 Some dimensional inspection equipment can be automated, but not all of it can be. If this is an important factor for your application, make sure it is a high priority in your purchasing decision. Ease of use should be considered if you are weighing multiple options. Will you need to hire new staff or train employees to use this new equipment? Does your budget support that? What is required to maintain the equipment? High-precision measurement equipment needs to be properly set up, regularly maintained, and periodically calibrated. Does your staff have the skills to do this, or can you outsource it? How durable and reliable is the equipment? Dimensional inspection equipment is an investment. It is important to compare multiple manufacturers and work with an expert who has experience will all of them. Perhaps one of the most important factors is your budget, however, be sure to weigh all of the above before you make a decision. If you would like to learn more about selecting the right dimensional inspection equipment for your application, download our free guide. You can also schedule a consultation with one of our dimensional inspection experts who can walk you through the entire process. Contact us today to schedule an assessment. 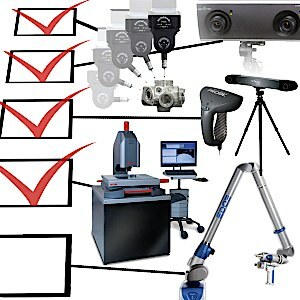 What type of dimensional inspection equipment are you looking for? Reverse engineering allows you to obtain the exact dimensions of an object so you can replicate it. Specialized laboratories have various types of equipment to measure almost any type of object, no matter how large or small, or detailed or precise. The measurements are then delivered in a format that will allow you to produce a copy. You might need to reverse engineer a custom part, an object that does not have original design plans, or a unique antique. 1. Do you understand the application? Reverse engineering a tennis racquet frame for a 3D digital marketing video requires relatively little precision. However, if the reason for reverse engineering is to produce an exact replica of an engineered airplane part, an entirely different (and possibly more expensive) measurement process will be required. Make sure your provider understands your reasons for reverse engineering so they can select the best measurement method for the application and your budget. In addition to accuracy, it’s very important to specify between design intent or as built reverse engineering. Design intent reverse engineering corrects for errors in the object’s original manufacturing. As built reverse engineering closely matches the original design including its imperfections. For example, a statue is a good example of something that would use the as built method whereas a damaged piston will certainly require the design intent approach. Both have their place and the choice will be determined by the given project. 2. Do you have the right equipment for my needs? If you do need a high level of precision, make sure the reverse engineering lab has equipment that meets the required specifications. In the case of a threaded nut, the equipment will need to measure both interior and exterior surface dimensions; not all measuring devices can do this as accurately as others. The type of material also matters when selecting equipment. If the surface of your object is reflective or elastic, different types of sensors are required. Talk to your provider about the equipment they intend to use and their reasons for selecting it. 3. Can you produce a deliverable format that meets my needs? Reverse engineering results can be delivered in a format as simple as a PDF (such as an engineering drawing), as detailed as a parametric 3D CAD model, or somewhere in between. Make sure your provider delivers a file that includes enough detail for your application and is compatible with the software you intend to use during the replication process. 4. Can you produce timely results? Your deadlines might impact the choice of equipment and measurement methods. In general, higher precision measurements take more time. Make sure your provider understands all of your priorities, including the amount of time it takes to produce results. Q-PLUS Labs provides reverse engineering services for a broad range of industries and applications. Our wide array of dimensional measurement and 3D scanning equipment allows us to tailor measurement processes to your needs, so you can get the type of results you need, when you need them. Contact us today to learn more. How has reverse engineering helped you grow your business? What Are The Types of Reverse Engineering and Why Does it Matter? Reverse engineering can be used for a broad range of applications, from precisely duplicating an airplane part that is no longer manufactured to making a mold to replicate an antique statuette. The type of reverse engineering required will depend on the specific application and the necessary degree of precision. Knowing these factors in advance can help you determine the type of reverse engineering that makes the most sense so you can get useful results and make the appropriate budget decisions. Exploring two extreme ends of the spectrum illustrates the difference between reverse engineering types and why it is important to understand them. Original object - Because having a high degree of precision is important, several original parts are required to generate the most accurate duplicate part. These several parts will be measured and compared; the average measurements are typically used to replicate the part. Tolerance - This represents the range of measurements that are acceptable. When working with a regulatory body such as the FAA or FDA, you generally must stay within a certain allowable deviation. Accuracy - A high degree of accuracy is required to meet the desired function of the part. Measurement approach - Many types of measurements using various contact and non-contact sensors will be taken with either a low-density ordered data or high-density data approach, possibly with millions of points to get the most accurate and detailed information possible. Purpose - You may want to create new tooling or parts for a high-precision application, or duplicate a part for which you do not have existing specifications. The result might be parametric CAD models, 3D mesh files, or engineering drawings that can be used for manufacturing. Original object - Generally only a single original object is required. Tolerance - The tolerance levels may not be important at all, making the measurement requirements significantly less onerous. Accuracy - The original object may have a more free-form geometry that does not require the same degree of accuracy. Measurement approach - Only 3D scanner measurement data may be required to generate a suitable duplicate and engineering drawings are generally not required. Purpose - You may want to get a digital representation of a product for a marketing video or reproduce products for manufacturing. 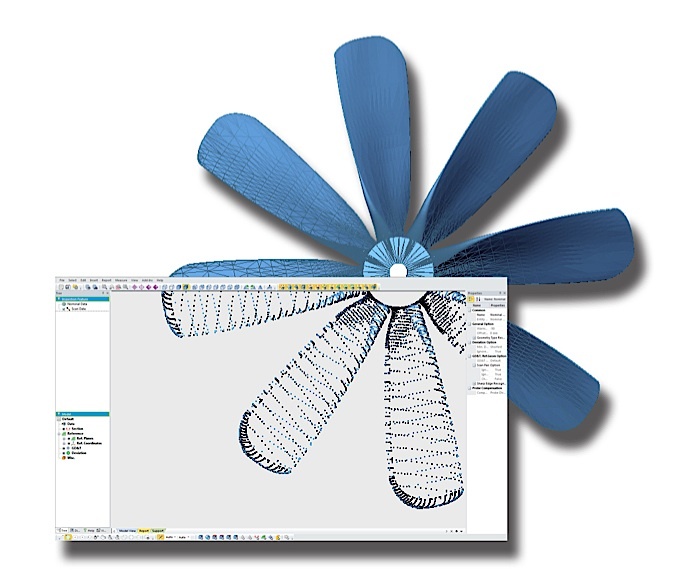 The result might be a 3D mesh or non-parametric CAD model that can be sent to a rapid prototyping machine and also allows you to compare reproductions to the original. Of course, there are a broad range of examples that fall between these two ends of the spectrum. A good reverse engineering lab can help you determine which reverse engineering approach is right for your project. If you need reverse engineering services, contact the experts at Q-PLUS Labs. We provide 3D scanning & digitizing, precision CMM measurement, 3D CAD modeling, and engineering drawing services to help you reverse engineer any type of part. Contact us today to learn more about our services.